Provide information about the automotive world as well as a review of car modification. If the Leaf's slow sales are anything to go by, you lot aren't convinced about pure EVs. Which is why the 2013 facelift is more about practical, real-world adjustments than driving home the futureland tech with radical styling. And it costs less, too. So, the money stuff. Nissan has introduced a three-tier range of trims - base Visia, Acenta and Tekna. But, wait, it gets sexier. Nissan's new pricing structure means you can either buy the Leaf and battery outright, or buy the car and lease the battery. There are five deals based on annual mileages between 7,500 and 15,000 miles, and for 12, 24 or 36 months. Short trips and sign up for three years? Then the battery's £70 month. Other deals could see you shelling out £109 a month. Prices vary from £15,990 to £25,490. Thing is, the cheapo is effectively the outgoing model with a new face, and doesn't get the new pump-driven heating system that's 70 per cent more efficient. To get the 25-mile range improvement to 129 miles, you need an Acenta. The £18,490 mid-ranger also lets you control the heating and charging remotely. As for the Tekna, it's mainly luxo-fluff like parking cameras, LED headlamps and heated seats. There are some across-the-board improvements, which make the Leaf a more formidable companion. It's 32kg lighter for a start - roughly the same as an ample German Shepherd. To whittle away the heft, it uses Nissan's new E powertrain, and the charger has been moved from behind the rear seats to under the bonnet, so there are no heavy wiring harnesses running through. The relocation also means there's 50mm more rear legroom and bootspace is up 40 litres. Then there's the driving. It's not really any faster (top speed's actually 0.6mph down; the 0-62mph sprint reduced by 0.4secs), but it feels less encumbered, cornering with less wallow. Body roll is better managed, and the heavier steering increases confidence. But there are still two major issues: charge time and range. Yes, it goes a bit further, and you can option a 6.6kW charger, which could halve recharging to four hours (providing you have a 32-amp charge point). But if you're using it for any more than short, city blats, there isn't yet the infrastructure or technology to fully support it, regardless of the improvements. With total worldwide sales now eclipsing 3.5 million units, the Mazda3 has racked up an enviable track record during its decade-long run to glory. Over the course of two generations, this engaging C-segment road warrior has become the automaker's highest-volume global offering as well as the firm's most important player here, where it currently accounts for over 40 percent of Mazda's annual U.S. sales. But in the super-competitive compact realm where the Mazda3 must face off against prime rivals like the Ford Focus and Honda Civic, Mazda wanted to stretch the envelope of the upcoming Gen III iteration in a major way. Due in showrooms this September, along with its Mazda3 Sedan sibling, this now even flashier 5-door matches aggressive "Kodo" styling language and a well-finished passenger compartment with the full complement of weight-saving/efficiency-enhancing Skyactiv technologies previously introduced on the CX-5 and Mazda6. We recently slipped behind the wheel of two Hatchback prototypes to see how well this new mix came together. While final judgment will be reserved for a true production unit, we can unequivocally confirm the latest Mazda3 incarnation does boast a full measure and more of Mazda's iconic zoom-zoom character. In keeping with tradition, the 2014 Mazda3 lineup continues to be split into "i" and "s" members for both body configurations. Motivating the Mazda3 i SV (Sedan only), Sport, Touring and Grand Touring models is a slightly tweaked version of the existing 2.0-liter/155-horsepower Skyactiv-G 4-cylinder engine found in the 2013 Mazda3 that now makes 150 lb-ft of torque -- up from 148 -- and has better mid-range punch. Mazda3 s Touring and Mazda3 s Grand Touring models replace the existing 167-horsepower/2.5-liter MZR engine with the more potent 184-horse/2.5-liter Skyactiv alternative that also appears in the 2014 CX-5 SUV and Mazda6. While the 2.0-liter can be backed by either a 6-speed manual or 6-speed automatic in all "i" trims, the 2.5-liter only comes with the latter unit that also includes steering-wheel mounted shifter paddles. The 2.0-liter Hatchback has already earned an official 40-mpg EPA highway rating with either transmission. At the moment, Mazda is projecting the 2.5-liter version will get 37 mpg on the highway, or 39 mpg on Grand Touring models fitted with active grille shutters and the innovative i-Eloop regenerative engine-braking system that's part of a Technology Package available only on the top-line model. Intent on creating a vehicle that would resonate more intensely with owners on both visual and visceral levels, Mazda complemented the 5-door's sleeker new sheetmetal and edgier fascia detailing with an even stouter but lighter core structure. Comprised of 60 percent high-strength steel, it endows the car with 31 percent greater torsional rigidity. Similar gains are found in the new Sedan, which like the Hatchback weighs about 100 pounds less than the existing 4-door. Wider, lower and marginally shorter than its 2013 counterpart, the new Mazda3 5-door complements 2.4 inches of added wheelbase with expanded front (0.8-inch) and rear (1.4- to 1.8-inch depending on wheel/tire fitment) track specs. Collectively, that dimensional rethink helps elevate its curbside aggression index while enhancing the car's overall dynamic potential. Keen to show off its newest player to full advantage, Mazda turned us loose on an appropriately challenging route that snaked through the Angeles National Forest outside of Los Angeles. Despite their significant weight drops, we'd characterize straight-line acceleration of the manual-equipped 2.0-liter and auto-equipped 2.5-liter versions we drove as enthusiastically spirited rather than blisteringly quick. However, there's little to fault about the speed or execution of cog changes performed by either of the Skyactiv transmissions. The true strong suit of this new Mazda is its ability to confidently carve through even the most challenging corners. The robust foundation teamed with a well-sorted suspension delivers impressive compliance and control while new electrically-assisted power steering proved both precise and rich in positive feedback. 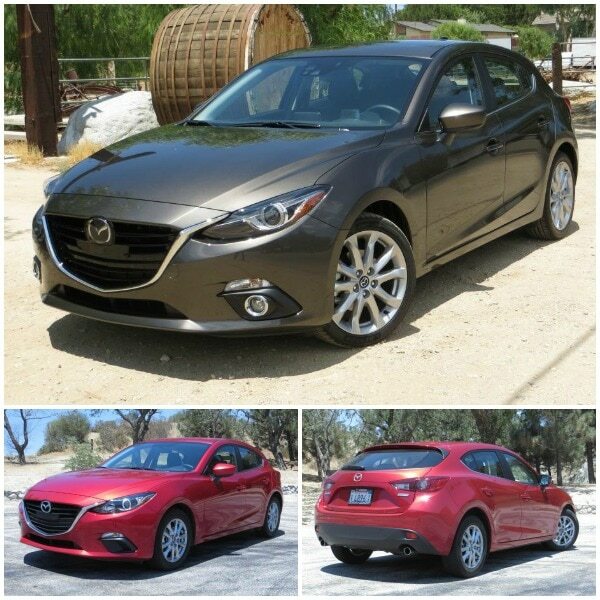 There is one key differentiator in the mix: All Mazda3 i models are fitted with H-rated 205/60 tires on 16-inch steel or alloy wheels, while 3 s Grand Touring variants roll on W-rated 215/45 all-season performance rubber wrapped around 18-inch alloys. Although it exacts a modest penalty in absolute ride comfort, the stickier but stiffer Plus-2 upgrade gives the 2.5-liter Grand Touring a decidedly more planted feel when you're taking on the twisties. Like its exterior, the passenger compartment of the new Mazda3 has a more sophisticated look and feel, whether appointed in cloth, leatherette or real leather. Repositioned A-pillars enhance forward sightlines while redesigned front buckets serve up greater support and comfort. Despite swapping a bit of legroom for marginally more knee space, the rear bench of the Mazda3 Hatchback can still handle a pair of average-size adults. Drop its 60/40 split back into a near-flat folded position and the 20.2-cu ft cargo bay expands into a 47.1-cu ft mini cave. Last but far from least, the new Mazda3 features a load of new "class-above" technology, including the latest incarnation of the automaker's HMI (Human Machine Interface) on select models. This "heads-up" approach to cockpit design nets a small pop-up Active Driving Display screen directly ahead of the driver that shows speed, navigation instructions and active safety data as well as a 7.0-inch color touchscreen, which for the first time is located on top of the dash rather than in the center stack. Paired with Mazda's console-mounted multifunction Commander, it affords quicker, easier and less-distracting access to various navigation and infotainment functions. The 2014 Mazda3 makeover also brings a host of new and more user-friendly connectivity features, including the ability to perform updates via a Bluetooth-paired smartphone. The system can now read aloud and respond to social, text and e-mail messages, and access thousands of Internet radio stations, audio books and other apps using Mazda's first implementation of the powerful Aha aggregator app. A similar leap forward has occurred in the active safety arena. In addition to features like Blind Spot Monitoring and Rear Cross Traffic Alert that are standard on Touring and above trims, the optional Technology Package for the Mazda3 s Grand Touring brings Lane Departure Warning, High Beam Control and two segment-exclusive features -- Radar Cruise Control & Forward Obstruction Warning and Smart City Brake Support. 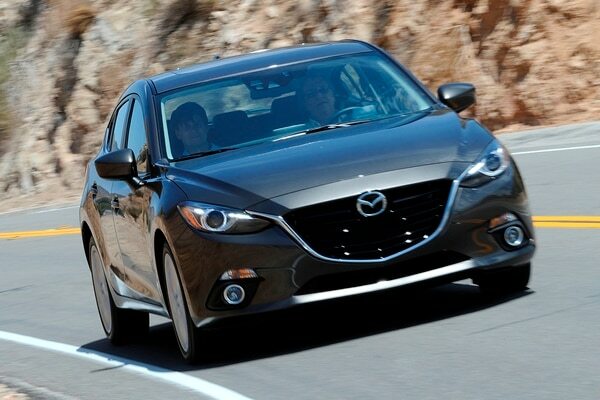 Pricing for the 2014 Mazda Mazda3 lineup will be announced closer to its arrival in showrooms. For the moment, all Mazda execs have confirmed is that it will open below $17,000 plus destination. All we can confirm is that the new Mazda3 is destined to become even more of a power player in the ongoing C-segment car wars. The commercial van market is currently dominated by Ford's Econoline van. Commercial trucks are generally functional vans with an emphasis on practicality over function. 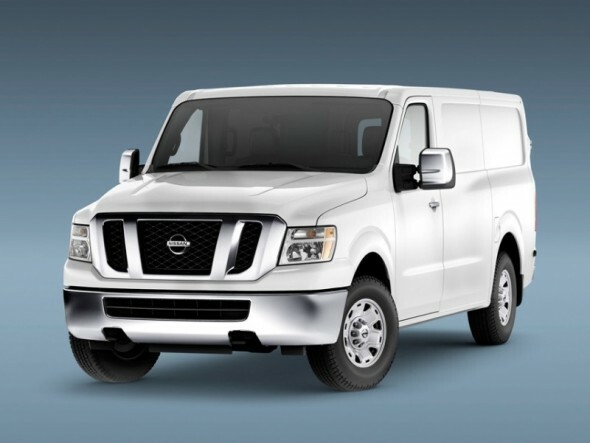 However, there's a new van on the market; the Nissan NV. This van has been available in over forty countries with exception of America. That's about to change with the introduction of the Nissan's commercial van. The primary target market is small business owners, delivery services and even food truck companies. There are two types of engines available for the Nissan NV; a six cylinder and a more powerful eight cylinder engine. This will be the first commercial vehicle from Nissan available in the United States. The van is equipped with a ramp which makes it accessible for handicapped individuals in wheelchairs. Some of the models are available with an adjustable roof. This can come in handy if one needs to haul large cargo along. It's also convenient to shorten the height in case the vehicle needs to be parked in a small garage or fit through a narrow drive way. Nissan is keeping the NV relatively affordable; the entry level model is expected to be priced around $24k. The frame was designed to be fully boxed for optimum stability and durability. Branding is an important concept for business owners and the Nissan NV allows you to do just that. The car can be "wrapped" with any design and logo of the buyer's choosing. The middle storage bin offers a large amount of space for personal items such as cellular phones. There is a console available which can be used as a laptop stand. Bluetooth compatibility is available which allows the driver to receive phone calls while keeping hands safely on the wheel. Buyers can choose from vinyl or cloth seats. Features including Bluetooth compatibility and a rearview camera can be added on as options.